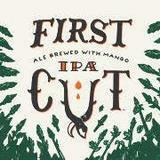 Ale Brewed With Mango. Each Spring, Hop Growers dust off their pruning shears and trim the first shoots, bolstering the bines for a rich growing season. First Cut – a mouthfeel of silky Simcoe and a touch of mango – is a nod to this ritual, without which the world would be a less happy place.